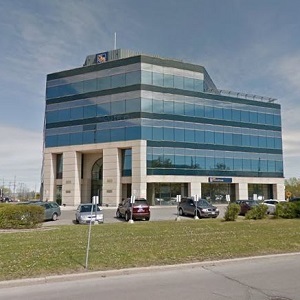 When Starlight Investments‘ True North Commercial REIT (TNT-UN-T) bought two suburban Ottawa office buildings in the fall of 2017, the property itself was only part of the attraction. A major reason True North snapped up the Bells Corners campus is because of who is moving in just down the road. The neighbour? Canada’s new Department of National Defence headquarters, which is being renovated and filled with thousands of workers just a kilometre or two away from the mid-rise office buildings at 301-303 Moodie Dr.
“(The properties) are the last buildings on Moodie before you get to the Department of Defence campus. There’s benefits to being so close to a large employer,” said Ian Thompson, senior asset manager for Starlight Investments. “I hope that the proximity is good for us and, certainly from what I’m hearing, it will be, especially for the ancillary businesses that do business with the DND. True North Commercial purchased the property for about $18 million in a sale brokered by Ottawa-based Primecorp. The 4.5-acre site consists of four- and five-storey office buildings plus a four-level parking garage on the north side. In all, they comprise about 148,500 square feet of leasable space, which was about 85 per cent leased when the purchase was made. The site has 585 parking stalls in both the parkade and outdoor, surface-level lots. Thompson said another attraction is the properties already boasted a strong roster of tenants, including Royal Bank of Canada, RBC Dominion Securities, Ontario Infrastructure and Lands, and Collins Barrow. They’ll soon be joined by others, Thompson said, as new leasing activity will push the occupancy rate to 90 per cent. That’s a significant change from 2016, when a marketing brochure listed 48,000 square feet — almost a third of the two buildings — up for lease. The conversion of the former Nortel Networks campus on Carling Avenue into the new DND headquarters is expected to drive demand for more commercial real estate in the area. The DND campus is forecast to bring approximately 25,000 jobs with it, and Starlight hopes to attract some of the prospective new businesses as tenants. To push its occupancy rate higher, Starlight has several investments planned in the Moodie Drive buildings. “The sort of things we’re hearing from tenants is that they want spaces outside of their cubicle or boardroom where they can get together to share ideas and have conversations,” said Thompson. First and foremost, Starlight wants to find an on-site food-provider. Though Thompson did not want to divulge financial details, other plans include modernizing the atrium, breakout areas where employees can work collaboratively, and shared boardrooms. A fitness facility is in the works, either in collaboration with one of the tenants or constructed by Starlight. There will also be an assessment of building operations to see what needs to be replaced and upgraded. Rents are currently at about $13 per square foot for 301 Moodie and $14 per square foot for 303 Moodie. Thompson expects that number to rise as the buildings are upgraded, and as existing space fills along with the DND buildings. Thompson said Starlight wants to take advantage of a developing trend in the West Ottawa office submarket, which will be further compounded when a light rail transit extension is constructed during the next five years. That trend is the exodus of at least some jobs from the downtown core as rail transit improves and expands. “I was at the Ottawa Real Estate Forum a few months ago and transportation and traffic jams certainly seemed to be the primary conversation piece which, being from Toronto, I found amusing,” said Thompson. An LRT stop at Moodie/Highway 417 is part of the next system expansion, expected to begin construction in 2019 and finish in 2023. The station will be about two kilometres from 301-303 Moodie, which currently has bus access. Once LRT arrives, Thompson said depending on how transit arrangements play out, Starlight will considering partnering with ride services such as Uber or Lyft to provide shuttles for employees during peak times. “Development follows transit,” Thompson said. “Just look at the expansion of Canada along the CN rail line. We’re fairly confident that, as that line gets out there and it gets easier for people to get there, there will be more development.